It was a really interesting day for radio today with several important announcements. Of most interest to me was the formal announcement of the advertisement for a second national DAB multiplex. You may remember that back in 2007, this multiplex was previously advertised with Channel 4 winning it ahead of NGW the transmission supplier (since bought by Arqiva). Channel Four promised a lot, but after winning the bid, the whole thing fell apart when Channel 4 decided it needed to shore up its television offering without heading out into the great unknown of radio. The timing probably wasn’t great, just ahead of the 2008 downturn. And indeed, shortly thereafter, the existing national DAB operator, Digital One, was struggling to fill its capacity. Ofcom went away a bit battered and bruised from the experience, and it’s clear that they weren’t going to return to the field of play until they could be certain that a new licensee would launch successfully with a range of services. Flash forward to today and Ofcom is again announcing a second national multiplex. Given where we are today, and the fact that Digital One is full, I don’t anticipate any problems finding bidders and filling this multiplex with services. As is required by law, the winner will be awarded the multiplex via a “beauty contest.” That is, what in Ofcom’s view is the best mix of services appealing to a wide range of audiences, as well as having a sound business plan and a plan to roll out the service to a good proportion of the population. Interestingly, while the multiplex as a whole needs to be complementary – i.e. services all need to be a bit different – you can directly target services carried on Digital One. Allied with this announcement is a revised set of technical requirements for DAB. They’re mostly important but minor things that I won’t comment on further here. But of particular note is the fact that D2 can use up to 30% of the new multiplex’s capacity for DAB+ broadcasts. What’s really strange is that they’ve limited it at all. It seems that pretty much everyone who responded to Ofcom’s initial consultation on this matter thought that there really shouldn’t be a limit to this and the market will dictate it. This is certainly true. Trials aside, a broadcaster is very unlikely to broadcast in DAB+ until they are certain that there are a decent number of potential listeners in the marketplace with compatible sets. If nobody can hear you, then you can’t make your commercial station work. Broadcasters can make that decision for themselves. Ofcom is going to look again at the limit in 2018. Which is fine, but feels like it’s making work where none is really necessary and overall is a little nannyish. And DAB+ is only going to be initially allowed on D2. For everyone else, you have to apply to Ofcom on a case by case basis if you want to either launch a new service in DAB+ on your existing multiplex, or switch your current one to the new technology. Again it feels over-regulated. If allowed to do as they liked, broadcasters would very carefully weigh up the pros and cons of switching technologies, well aware of the fact that they would almost certainly lose audience at this stage. Ofcom somehow thinks that broadcasters might deprive listeners of current DAB services by replacing them with DAB+ ahead of consumer uptake. Again, that’s wrong thinking. That all said, I wouldn’t be surprised if there was a test here or there on a multiplex that otherwise has plenty of space. Let’s not get too side-tracked about the relative merits of DAB and DAB+. I always feel that it should be likened to Freeview and Freeview HD. If you’re still watching digital television using a first generation OnDigital box, then your viewing is pretty limited now [Update: Thanks to James Hamilton for letting me know that those old OnDigital boxes were completely broken by DSO if they hadn’t been already]. Today, however, pretty much every television comes with Freeview HD built in, and many can also receive Freeview Connect and similar streaming services. As for the range of channels? Well nobody is going to get too excited by Channel 4+1 HD or 4seven HD which were recently announced as coming soon to Freeview. But that’s a commercial decision for channel operators and multiplex owner Arqiva. Anyway, if you want to bid for the second national DAB multiplex, you have until the end of October to get your application in with your £50,000 application fee. The other big news was the announcement of major changes across BBC Radio Five Live’s weekday daytime output. This sees the departure of big hitters like Victoria Derbyshire, Shelagh Fogarty and Richard Bacon. The station is shrinking three shows down to two – which I imagine is part of their DQF savings – with the multiple-award winning Derbyshire being replaced by Adrian Chiles for part of the week and Peter Allen for the other part of the week. Once ITV’s contract with the Champions’ League has ended, Chiles is going to have more time to do things like radio, although there’s still a season of that to run, so Chiles may be heading to Manchester airport sharpish on Tuesdays if he’s still in the chair for away games next season. The morning show extends to three hours, and then an extended afternoon show begins with Dan Walker and Sarah Brett replacing Richard Bacon. 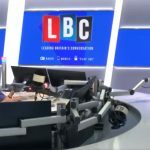 I’ve always liked Richard Bacon, as he knows his stuff – but he’s perhaps not the world’s greatest sports fan which can be a problem on Five Live. And sometimes he feels a little uncomfortable during breaking news when he has to segue seamlessly from what’s on TV this week to some court case verdict. There were rumours that he was up for ITV’s breakfast relaunch. One way or another, he’s going to pop up somewhere else fairly soon, I’ve no doubt. On Twitter this afternoon, Bacon said that it was his choice to leave Five Live. I’d also imagine that Victoria Derbyshire and Shelagh Fogarty will show up either on Radio 4 or TV fairly soon, with an unnamed TV news project for Derbyshire first up. Perhaps, because this would seem to remove some high profile women from the schedule, as well as Sarah Brett co-presenting afternoons with Dan Walker, Eleanor Oldroyd gets a Friday lunchtime show ahead of the still-two-hours Mayo and Kermode Film Review. The lack of solo female shows is also going to be highlighted, with two staples disappearing, especially following previous announcements that suggested the BBC wanted a much more even male/female presenting split. I’d also argue that lack of racial diversity might also be an issue. Tony Livesey is perhaps the big winner. He’s progressed from late nights, to weekend breakfast, and now taking over Drive with Anna Foster. While I can never quite forget that he was once the editor of the Sunday Sport and famously appeared in a Channel Four Cutting Edge documentary about the paper. But he’s very good, and will slide pretty comfortably into the role. There are a range of other changes including a new pair of Fighting Talk presenters for next season, as well as some other presentational changes. Five Live certainly doesn’t do things by halves. As a fairly regular listener – it’s my default station – I’ll be paying close attention! Disclaimer: As always, these are my views, and they do not reflect those of any past or current employer. They are mine alone. Just so we’re clear! Also, I listen to a lot of Five Live. Although not mentioned in the document, the Digital One DSPS provider for the 70s/80s/90s TBA format is Global Radio (it’s been approved as a replacement for Smooth Radio). I was pretty sure it was Global’s, but I’ve been out of the loop! So thanks for that Ash.